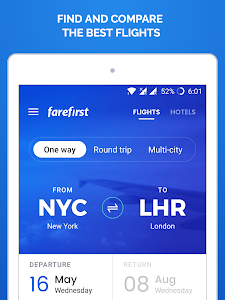 FareFirst finds you cheap flights and best hotel deals. 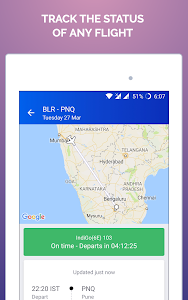 We also help with real-time flight status tracking. 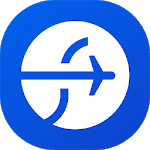 We compare all the top travel sites in one simple search and help you to find the best flights and hotels. Our verified 1000s of online travel agencies and airlines helps you to cover worldwide travel needs. 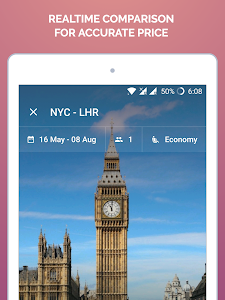 We cover both domestic and international market to find the hottest deals, even last minute flights. 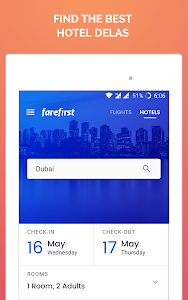 Our specialized and optimized search engines ensure you always get the best deals and help make your travel more comfortable and pocket-friendly. 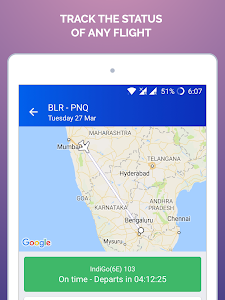 We are in tie-up with much low-cost budget airlines to find airfare from airlines website directly. We also provide you with the best offers, deals, and discounts on hotel booking. Here you can find the best price hotel, motel, BnBs, Vacation rentals, Guesthouses and more. 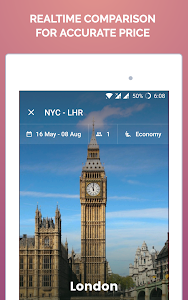 It’s free, easy, fun to use and you can save time and money when booking your next trip! 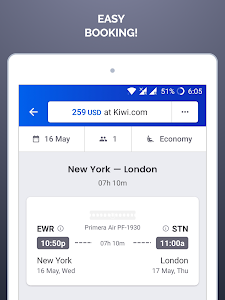 So why pay more for the same when you can find the best on fare first? 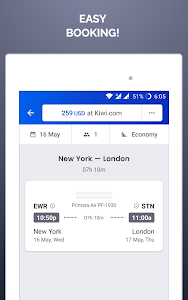 Popular agencies we comparing are such as Cheapticket, Expedia, Omio, FlightNetwork, My trip, Tripsta, Smartfares, Travelgenio, Momondo, Kayak, Kiwi, Musafir, Opodo, Orbitz, Kupibilet and much more in this list. 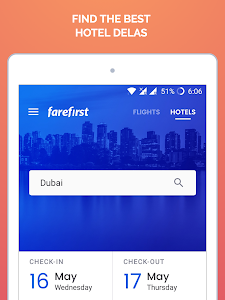 And for hotels, we compare Expedia, Venere, Hotels com, Holidaycheck, ebookers, Booking com, Priceline, HotelTonight, Travelocity and more! 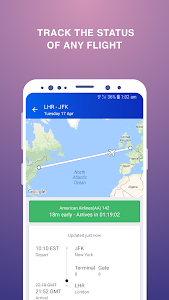 Popular airlines we listed are Emirates, Qatar Airways, Singapore Airlines, Cathay Pacific, All Nippon, Etihad, Turkish, EVA Air, Qantas, Lufthansa, Garuda Indonesia, Hainan, Thai Airways, Air France, Swiss International, Asiana, Air New Zealand, Virgin Australia, Austrian Airlines, American Airlines, Air India, Jet Airways, Spicejet, Vistara, Southwest, United Airlines and budget airlines such as AirAsia, Norwegian, JetBlue, EasyJet, Jetstar, Asul, Vueling, easyJet, Cebu Pacific, Indigo etc. 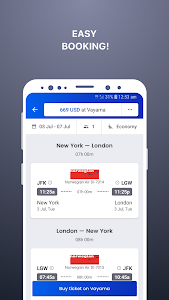 • Top Flight Search Engine - Our search engines compare 1000s of airlines and much more online travel agencies to get you the best and lowest flight ticket. 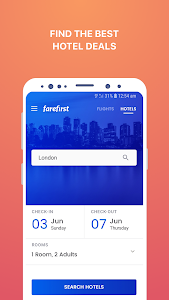 • Top Hotel Search Engine - Compare all the top travel sites in just one search to find the best hotel deals at FareFirst.com - awarded world’s best hotel price comparison site. • Advanced filter option - Find your preferred deals easily through our advanced filter option which is available in all categories. • Commission Free - We charge you zero commission. You need to pay the exact amount as shown without any additional fees added. Absolutely no hidden charges. • 24x7 Customer support - In-app build customer support options such as Live chat, Email support, and ticket support. So no worries in case you need any help. 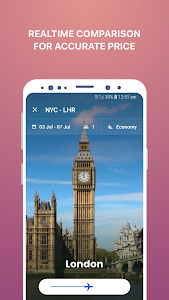 Information: Our App helps you to find cheap flights between two destinations. 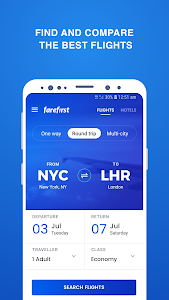 We don’t sell airline tickets, we are looking for the best fares available and lead you to airlines and agencies websites to conclude your booking. 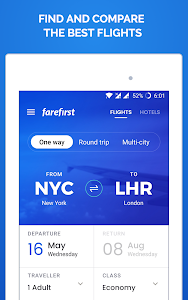 Similar to "Cheap Flights - FareFirst"